One of the top new games in 2009 is a new variation on the Classic Connect 4 Game. 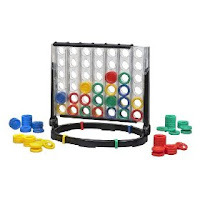 The new Connect 4 x 4 Game provides new life to the classic game. This new game is for 2 to 4 players and adds more complexity and more chances to win with a new double sided grid. Perfect for families to play together with kids age 8 years old and up. Here is a video of the 30 second commercial so that you can see it in action. Read customer reviews at amazon.